At the heart of the rugged Kii Penensula looms Omine-san, a sacred mountain of limestone precipices topped with virgin forest in which nestle the temples and shrines of the idiosyncratic Shugendo school. Various routes lead to the top, from ancient Yoshino or nearby Dorogawa, through lovely forest and across cliff faces, passing stele, shrines and other vestiges of an intense past. 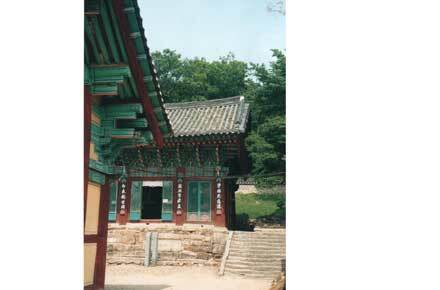 An ancient processional ramp leads to the main temple on a platform at the top. The summit above commands gorgeous views of ridges receding into the gentle Asian humidity-haze. This is a tiring walk in a frequently wet area. Come prepared. High in the Kii peninsula, south of Osaka in central Japan, an ancient pilgrimage route struggled southward from Yoshino, briefly an imperial capital, to Kumano on the south coast, crossing the rough mountains of the peninsula's interior. At the heart of this area lies Omine-san, a mountain of limestone precipices topped with virgin forest in which nestle temples, shrines and lodging-houses. 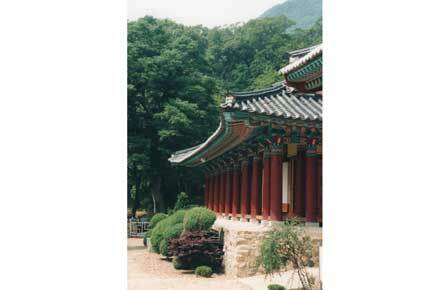 And the occasional shed housing scrubby teashops, noodle stalls and purveyors of religious tat. 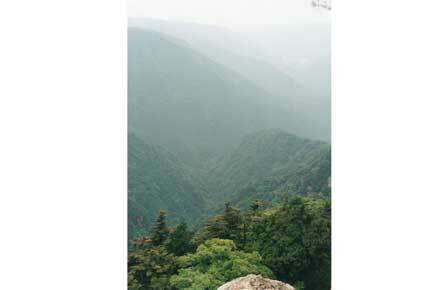 It is strongly reminiscent of China's famous sacred mountains such as Huashan or Emei Shan. Originally the home of Shinto kami (spirits and more), these mountains have long been the retreat of ascetics and hermits. Following the introduction of Buddhism to Japan in the 6th Century, they became an important centre of pilgrimage and retreat for the idiosyncratic Shugendo school, which incorporated elements of Shinto and shamanism into an ascetic form of Buddhism. 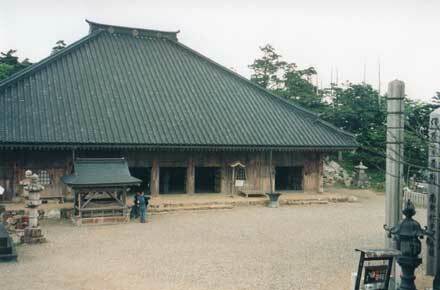 The semi-legendary En-no-Ozunu, who founded the sect, founded a monastery at Omine-san in the early 8th Century. 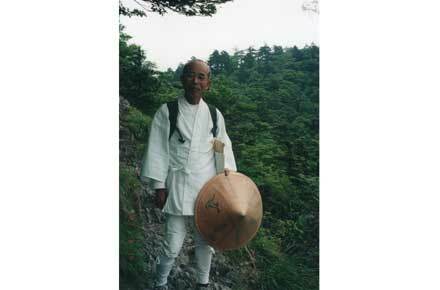 The sect's practitioners, yamabushi (mountain priests), dressed in white from their flat wide brimmed hats to their shoes, still labour up the mountain, mainly as pilgrims now rather than residents. Although Shugendo was suppressed in favour of Shinto during the Meiji period, it still has a surprising number of adherents. 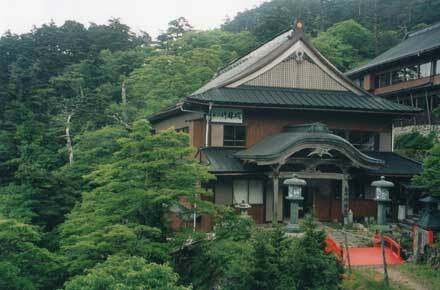 A Yoshino to Kumano pilgrimage, climbing Omine-san on the way, became essential Shugendo practices. The Omine-san trail is redolent of these years of profound belief: temples, shrines, steles and meditation points are sprinkled along the way. The whole pilgrimage was clearly a very hard journey. 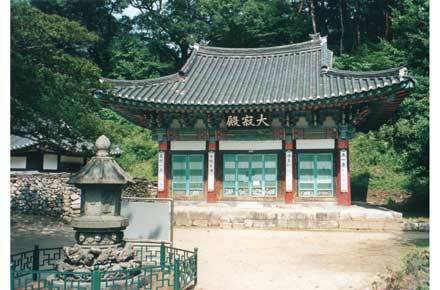 On the mountain, food was restricted to plants foraged along the way and arduous meditation and purification rituals had to be performed. These rules were fiercely enforced by local inhabitants, particularly those from Dorogawa, beneath Omine-san sometimes by jaculation, or throwing offenders (and indeed those who fell ill) off the many cliffs around the mountain. This remains a rugged landscape of remote valleys and a formerly impassable series of high, sheer, interlocking ridges. It remains mysterious and off the beaten track, even to the Japanese, although modern tourism and a series of road tunnels, built during the infrastructure building craze of the 1980s and 1990s, mean that the great mountain is now busy on weekends and holidays. Nowadays, most people climb the mountain from Dorogawa, a pretty if tourist-compromised town of ryokans (traditional inns) and micro restaurants straggle along the bottom of a deep forested valley. It takes 8 hours to make the circuit to the top and back. You can also walk in along the ancient pilgrimage route from Yoshino, and indeed follow the trail for three or four more days down to the coast. From Yoshino it is a tough 25 km slog over three sub-peaks and will require a night's camping. The first hour or so ascends the spine of Yoshino-yama (mountain) through this brief imperial capital of the "Southern Emperor" during the civil war and competing imperial claims of the 14th century. 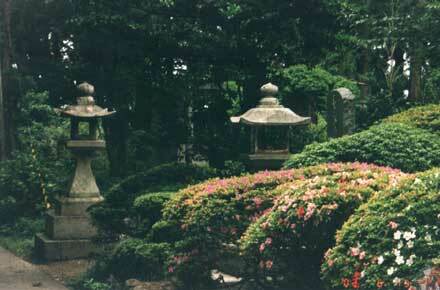 Yoshino is now a delightful, historic backwater, and the path winds under vast, ancient bronze torii gates marking the transition from this world to paradise, past temples grand and diminutive, ancient mossy precincts, ryokans and restaurants. Yoshino-yama is famous for the beauty of its cherry blossom. After Yoshino, the path spends much of its time struggling up the mountain spine through the blanketing plantations of Japan?s main source of... er... disposable chopsticks. This is interesting walking, but hard and, until one approaches Omine-san, not exceptionally inspiring. From Dorogawa: There are various routes. Walkopedia took the longer-but-prettier one. The first 1.5 hours follows a road through pleasant stands of mature pine, past shrines large and small and a famous source of healing mineral waters, now gushing unromantically from a series of waist-high taps sprouting from a long pipe. A track to the left crosses the stream, then winds laboriously up to a newish and somehow inappropriate-feeling tunnel. You can save time and suffering by getting a ride up to the trailhead near the tunnel. From here, the path grinds steeply, at first rather painfully, through uninteresting pine plantations, towards the dip in the main ridge at Gobanseki, where it meets the ancient trail from Yoshino. Higher up, it enters beautiful, unsullied deciduous woods as the valley side becomes more precipitous. The torii gate at Gobanseki, beside a shrine in a pretty ridgetop clearing, gladdens the heart after the slog from the valley bottom. This would be a delightful place to camp, although it has no water. Unfortunately, this is as far as women can go: they are strictly barred from the heart of the mountain, and to press on will cause deep offence and possibly even result in violence. It is here that the best of the walk begins. The path winds up to an exceptionally pretty, sheer ridge, clad in deciduous trees and gnarled old pines through which the main Omine massif and its crags appear, their ridges zigzagging away above misty blue valleys. 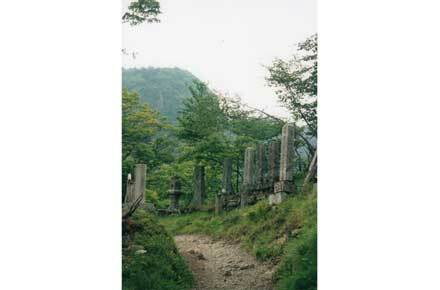 As I approached the junction with the main modern path from Dorogawa, mossy memorial stele and shrines lined the path, crumbling testaments to a long tradition of faith. A vast shed of patched corrugated iron filled with stalls and daybeds marks the junction. It was devoid of people midweek but clearly catering for labouring multitudes at weekends. Some more ridge walking leads to the "difficult" bit, a spectacular clamber up the bare rock of the ridge spine, dizzy precipices each side, using ladders and chains to haul oneself up the steep bits. A famously awkward section is known as Kani-no-kabe or crab-walk. It is strongly reminiscent of sacred mountains in China, whence Buddhism came to Japan, with ancient paths clinging to sheer rock faces, passing prayer spots and memorials, although Omine as a spirit-home predates the arrival of the Buddha. The views are superb; tiny Dorogawa rests in the valley way below, the crags and cliffs of the summit loom dead ahead and ridges recede to the blue horizon all around. The trees are stunted here, clinging to crevices in the rock. Invisible birds chirrup, while their predatory cousins sweep past in the thermals. A final struggle will have you at the famous Nishi-no-nozoka cliff, where pilgrims are (still?) hung by their feet out over the precipice to confess their sins and strengthen their faith. Jaculations of those caught breaking the rules also happened here. The summit is not far from here. 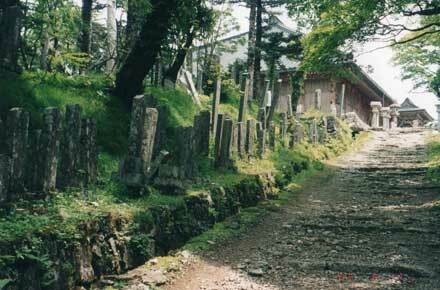 An ancient processional ramp, ground down out of the rock and lined with stele and little shrines, leads to the main Sanjo-ga-take temple on a platform at the top. After the expectations which mount during the climb, and the beauties of the temples at Yoshino, it was actually a bit disappointing when Walkopedia was there in 2002. On the summit above the trees around the temple is an expanse of bamboo grass, at 1719m with gorgeous views of ridges receding into the gentle Asian humidity-haze. Limestone stacks emerge from the dense forest of the nearest spine. Walko descended by the steep main path back to Dorogawa, which is much more heavily walked than the Gobanseki loop, but still pretty and affording lovely glimpses of the valley far below through the thick trees. At the bottom it winds through silent stands of large, stately pines and passes graveyards thronged with stele near the roadhead. From here it is a pleasant 45 minutes trudge through the forest, with the river rushing below, Back in Dorogawa, with a welcome cold beer while shopkeepers gossip and children chase each other in the street, the mountain will seem not just remote, but to belong to another world. See the article: "An ancient path to Nirvana leads a Buddhist monk up a mountain?again and again and again". 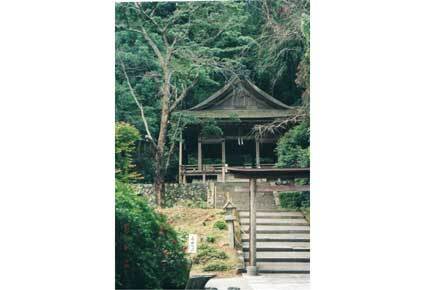 And, see our Kumano Kodo page for more general and practical information and photos.